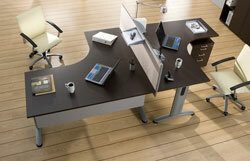 ROF is the office furniture specialist serving businesses in and around the Orlando, Florida, area.Â We sell new, used, and refurbished/remanufactured furniture from all of the leading names in the industry, so you can rest assured that when youâ€™re shopping at ROF, affordability is never a compromise for quality. Many of our customers have saved up to 80 percent off the original manufacturersâ€™ price, but still receive commercial-grade furniture that will be able to withstand daily use. Considering we carry office furniture from Herman Miller, Indiana Furniture, and Steelcase, among many others, this is an outstanding value. To see the office furniture we currently have available for your office, stop by our showroom located just a short drive away from Orlando, FL. For more information on our products and to inquire about the financing options we may have available for you, contact ROF today. One of our helpful associates would be happy to assist you.